It’s simple. We integrate our team with yours. 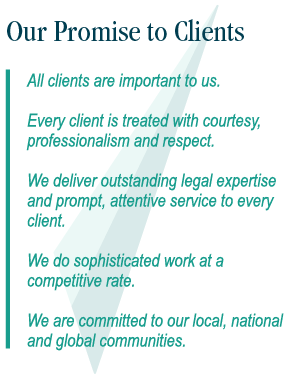 Senior-level attorneys lead each client’s legal team and serve as project managers. For many clients, project managers serve as the client’s “in-house” counsel or an extension of the in-house team already in place. This integrated team-based approach allows us to provide our clients with world-class representation coupled with the level of responsiveness and attention that is only possible in a smaller, more agile working environment. Relationships are paramount. By getting to know our clients and their businesses, we are better able to anticipate their needs and exceed expectations. Service comes first. Nothing short of excellence will do. Cost-effectiveness is vital. While we have always kept costs in mind for clients, particularly since the latest recession, we’ve been acutely aware of the pressure our clients are under to watch the bottom line – and we work hard to keep our costs low. We interact with owners and managers of a diverse portfolio of multi-million dollar corporations, earning their trust and respect far beyond the typical attorney-client relationship. Our firm has struck a chord with large and mid-size businesses (public and private) that look for an alternative to the “Big-law” experience, and we’ve represented 17 Fortune 500 companies since our inception. As a firm that began with only four people, we’re also passionate about working with small businesses, including start-ups.